On April 29, 2008 the members of the public Association “KZ BIKE” headed by The famous biker D. I. Petrukhin made another spring bike-throw. The purpose of the route this time was a specialized complex for orphans “ZHANUYA”. It has already become an annual tradition of the bike club – when busy with the usual business cycle adults at the call of the heart direct their” steel horses ” on a weekend out of town to the countryside, and to the gate, behind which live and grow small single people – pupils of orphanages and boarding schools. Almaty bikers show genuine kindness in taking care of the smallest and most deprived. “We organize fundraising in advance, throw a cry and do it all with joy. In this, perhaps, there is our main difference — that we, bikers, can quickly and clearly all organize. And about the amount of the fee – everything is democratic: everyone gives who can, starting from 1000 tenge…”, – says Dmitry Petrukhin. Children will be the first to learn from the Director Hafiza Serikova about the upcoming meeting. They are looking forward to their most exotic and” cool ” guests, prepare a concert. “Such meetings and such attention are very pleasant and joyful for our children. We, as children stare at the bikers, their motorcycles and equipment. When Dmitry Petrukhin tells the children about his travels, we see in their eyes the excitement and the birth of a dream! Contacts with the world of adults, and even such cheerful, positive, giving a good, healthy example, are very, very necessary and useful for our children”, — said Hafiza Serikovna. Bikers bring children gifts, communicate on the “short leg”, roll them in the yard. Celebration of human communication and friendship between big and small Almaty is always fun, but ends too soon, especially for kids. And it is a pity to part with them, leaving alone with his childish plight. “Go with us, and young bikers 16-17 years. For them, this is a severe allowance for irresponsibility of parents who abandoned their children. Of course, we all have different fates, but the most important thing for the youth to understand and feel someone else’s pain, to treat future offspring more responsible than these failed parents, not to cripple the fate of loved ones,” says the biker-world wider, the father of two adult sons. And here at the appointed hour from the office of the bike club left about 100 Almaty bikers and a minibus with gifts for children. On this Saturday, the yard of the orphanage was filled with bright sun and happy smiles of children. When the bikers friendly convoy drove into the front of the school, then the roar of motorcycles drowned out the children’s cheers and applause. And here they stood facing each other bikers and children. It was a moment of genuine happiness of meeting and human communication. The pathos of this moment, supported the brass band of the orphanage. Surprisingly, it includes 5 girls and only two boys. 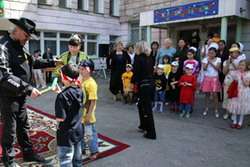 The cheerful greeting of the children led by the school principal Galiya Khafizovna Serikova, then the hot greeting of bikers led by Dmitry Petrukhin grew into a festive concert of talented children and a cheerful joint round dance with bikers. Boys and girls aged 5 to 16 years all eyes looked at the guests and as the sunbeams, jumping, clapping their hands, radiating with a kind and bright light clean baby shower. Three big bag of all sorts of different (soft, sport, visual-cognitive) toy received the children’s home as a gift from the bike club. Special Souvenirs from Dmitry Petrukhin was awarded the best students — excellent students, the best singer and singer, cool rappers, and super DJ. The bike club provided with the professional forces photo and video filming which results children will receive for memory. The final friendly reception were riding bikes. Speaking of bikes-a spectacular sight! Which can only instances seen children in his yard: and light sports “indurite” and extravagant-elegant “choppers”, and a solid heavy “cruisers”. And what tuning and equipment! Bikers everything shone and sparkled! This festive bike parade! Skating brought our little friends in delight, which was passed on to carers. Those, too, sheepishly asked for a ride that bikers are enthusiastic and wind did! The meeting ended with an exchange of sincere thanks. Educators and students accompanied bikers with a light heart, because they knew that they are always there and will come to their aid on the first call. And they will keep hearts warm this holiday for a long time!